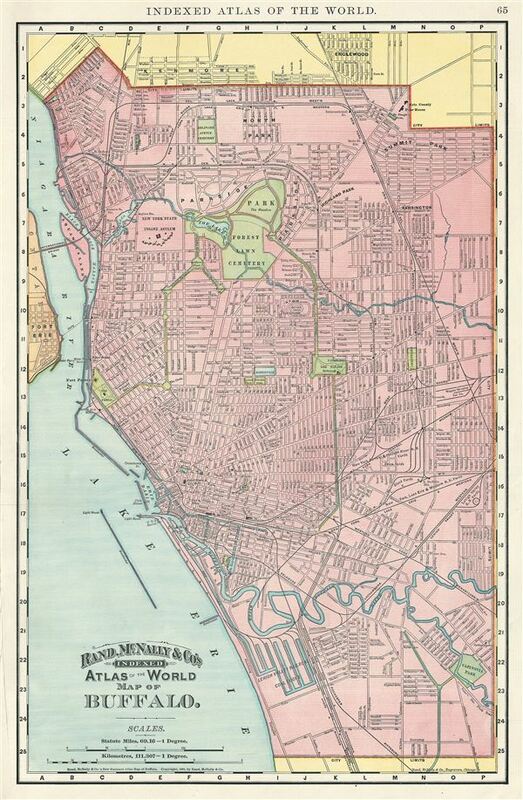 This is a nice example of the 1892 Rand McNally and Company map or Plan of the City of Buffalo, New York. It covers eastward from Lake Erie and the Niagara River and covers the entire city of Buffalo, including part of Fort Erie, Kenmore and Englewood. The map is highly detailed and notes rivers, parks, docks, cemeteries, reservoirs, railways, and other topographical details. Individual streets and buildings are identified, including the New York state insane asylum, court house, city hall, etc. Joseph Elicott, city planner and surveyor for the Holland Land Company, designed and laid the grid system seen in this map. This map was issued as plate no. 65 in the 1893 edition of Rand McNally and Company's Indexed Atlas of the World- possibly the finest atlas Rand McNally ever issued. Very good. Text on verso. Minor verso repair in left margin, not extending onto printed area. Rumsey 3565.075 (1897 edition). Philips (atlases) 1026 (1898 edition).